Here, we found that SphK1 and its product S1P regulate mitosis. SphK1 promoted proper mitotic progression in a SAC-dependent manner, whereas increased SphK1 activity accelerated mitosis (Movie S1 and Movie S2). 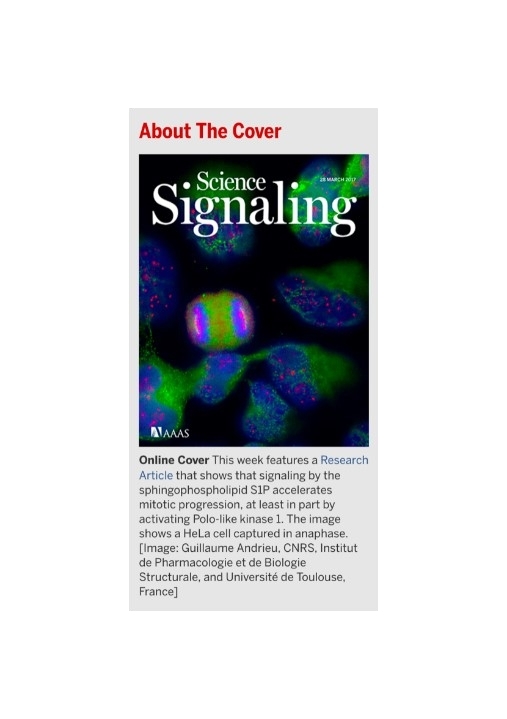 S1P overrode the mitotic spindle checkpoint, led to premature mitotic exit, and induced chromosome segregation defects through a pathway involving S1P5 and phosphatidylinositol 3-kinase (PI3K)–AKT signaling that was at least partially mediated by Polo-like kinase 1 (PLK1). In summary, our study uncovers a previously unknown role for SphK1-S1P-S1P5 signaling in controlling proper mitotic progression through prometaphase to the metaphase-to-anaphase transition. More generally, our findings support the concept that cellular micro- environment plays an important role in coordination of mitosis and paves the way for future studies evaluating the relationship between extracellular signals, mitotic progression, and chromosomal stability. Movie S1. Representative movie showing mitosis in a GFP-expressing cell. Movie S2. Representative movie showing mitosis in a GFP-SphK1–expressing cell.